The mix had been recorded a few days earlier, as live, one afternoon at Legend in Manchester (the club closed at the time). 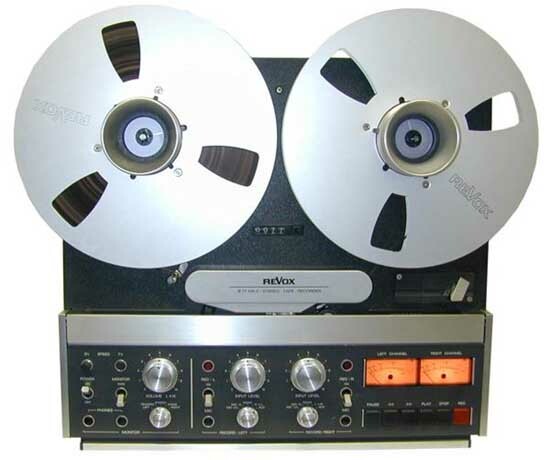 Mike Shaft had brought along a Revox B77 reel-to-reel to record onto, the machine being the portable unit of choice throughout the radio industry in this country back then. This was the first time the Revox, which has since played a constant role in my work, entered my life. At the time I had no means to record at home, but by the end of the year, following the runaway success of the mixes, which would subsequently become a regular feature on Piccadilly, I’d purchase a couple of Technics SL1200s and a Matamp Super Nova mixer (this was at a time when, with the exception of London DJ, Froggy, who used them for his Roadshow, no UK DJs had such equipment at home). To top things off I bought my first B77, so I could put together my mixes at home, which would serve to lead me ever-deeper into my obsession with editing. So glory be to Mike Shaft and to Piccadilly Radio for facilitating this life-defining arc of continued discovery. The reel of ¼ tape onto which that first mix was recorded onto was, as with most of my radio mixes (the final one, ‘The Best Of ‘83’, being aired in December 1983), lost – probably copied over at some point or other, having been stored at the station. I managed to salvage a few of these mastertapes, most importantly ‘The Best Of ’82, but the original mix wasn’t amongst these, and I only had it on an extremely lo-fi cassette recorded from the radio at the time. As the author / DJ Dave Haslam once said, the mixes “were probably some of the most taped programmes in Manchester radio history”. These tapes would also spread further afield than the Greater Manchester region that Piccadilly broadcasted to, with copies, and copies of copies, finding their way into cassette players and ghetto blasters in all corners of the country, often without people having a clue about their source – this was the ‘mixtape’ in its earliest form from a British perspective. One such recipient of my mixes was Stafford based Pezz, then a 14 year old lad discovering his musical influences, and later of the fabled Nottingham-based soundsystem and DJ collective, DiY, who were amongst the pioneers of the UK free party scene, having formed in 1989. I’d meet Pezz at the Liverpool offices of 3Beat, the record shop / label he worked for – this was in 2002, 20 years on from when my radio mixes first aired. My DJ comeback was still in the future, and I was very much an obscure name from the past at best, most people of Pezz’s age brought up on a later generation of DJs. So his excitement at meeting me was unexpected – he was talking about this tape from back in my Piccadilly days that had made a big impact on him and his friends at the time, as they set off on their own personal dance music odysseys, and asked me if I could identify a couple of the tracks featured (these ids having eluded them for 2 decades). It turned out that one of his big mates back then was Dean Meredith, later of Bizarre Inc, who enjoyed chart success in the early ’90s, and more recently Chicken Lips (whose ‘He Not In’ I edited on my first ‘Credit To The Edit’ compilation in 2005), and that this tape had been a major influence on the sound of his latter project, which, along with Bizarre Inc, was produced in collaboration with partner Andy Meecham. As soon as I’d met Greg, an excited call was made to Dean. ‘…. Hey kid, guess what! I just met Greg Wilson – No way – I need you to send me a copy of the tape up as soon as possible….’ Then came the months of waiting more phone call’s hassling to get a copy before eventually with the bribe of digitally remastering it onto CD it finally arrived! In the meantime I’d had many conversations with Greg and e-mail’s were exchanged, one of which contained a list of essential Electro-Funk releases. This list was full of records I, and anyone I showed it to, had never heard of, apart from some obvious classic’s such as the Peech Boy’s ‘Don’t Make Me Wait’, and Afrika Bambaataa’s ‘Planet Rock’. When I finally sent him a copy of the tape I’d got from Dean he identified mysterious artists and titles like The Gunchback Boogie Band’s ‘Funn’ and Jimmy Spicer’s ‘The Bubble Bunch’. I began hunting down these tracks on the internet, the first to arrive was Larry Graham’s ‘Sooner Or Later’, and the excitement of finally getting my hands on these tunes was unreal, mindblowing! I hadn’t had such a buzz from buying records in years. A goal was then set to collect every track on the tape. Gradually over the coming weeks all but a handful were found. In the meantime, Greg found the old tracklistings for his first ever mixes for Mike Shaft, which just happened to be the two mixes contained on the legendary tape. I was then able to find all but two tracks, or rather two small drum sections he used in the first of the mixes. Not even Greg can recall where these came from! Before long it seemed obvious that listening to this 20-year-old tape was not enough. After collecting these, and a host of other early ’80s Electro-Funk releases, I decided that the only thing left to do was to re-create the mixes myself! Rather than just re-do them as Greg did back in ‘82 on the decks at Legends. I decided to use the computer to ensure the tightest of mixes and present them in today’s highly polished manner (I also lifted and cleaned the missing drum parts direct from the tape). The whole concept of taking someone else’s work and re-creating it is quite strange, and actually completing it and then re-presenting it to Greg felt even more bizarre. Thankfully he was really into what I’d done, especially as the original ¼” masters have been lost and, like myself, the only copy of these mixes that Greg had was recorded onto cassette from the radio. So, to mark its 30th anniversary, this reconstructed version of my first ever radio mix, which was painstakingly pieced together by Pezz, has now been uploaded onto my SoundCloud. 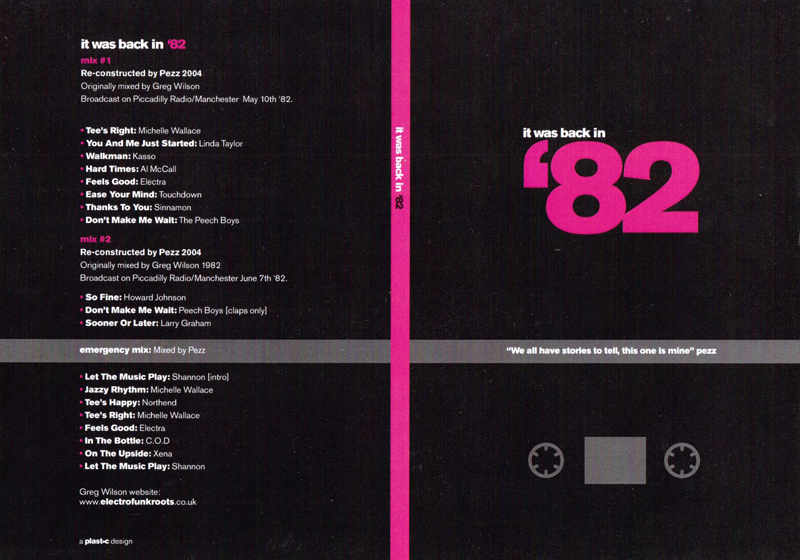 The mix would be the first of its type on British radio, and following the fantastic response to mix 1, Mike Shaft decided to make it a regular feature, with new mixes every 3-4 weeks. It would have an instant impact in the clubs, with Legend’s attendance, which was already on the up, going through the roof in a matter of weeks. 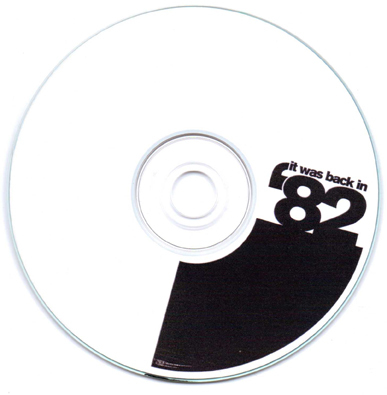 It was a momentous month, which also saw the release of the seminal Electro track, ‘Planet Rock’ (see: http://www.electrofunkroots.co.uk/articles/when_the_planet_rocked.html) and the opening of a new Manchester club, which I’d DJ at later down the line, called The Haçienda. My career was about to go into overdrive, and ‘The Greg Wilson Mix’, as Mike, in his distinctive mid-Atlantic drawl, would introduce it, was a major part of this process.